The new MTI-V’s offer the performance, comfort and customization for those that demand only the very best. Each MTI-V is custom built to suit your needs and boating lifestyle. 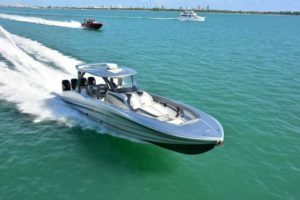 Sport, performance, fishing, family, luxury, or a tender to a super yacht. The patented hull design offers a ride unlike anything else in the Vee Bottom world. The hull design utilizes twin keels, similar to a catamaran, yielding straight, stable, and predictable handling at all speeds. The step design also allows us to introduce air under the hull and trap a boundary layer air under the hull between the twin keels. The MTI-V 42 is extremely dry riding even in extreme conditions. The boat keeps its bow high in both head and following seas. The wide bow does an excellent job of knocking down big swells. Every MTI-V is custom built for each individual client. Every client has their own definition of how the boat needs to function for their boating lifestyle. The MTI-V offers our clients nearly endless options and possibilities. Several different seating configurations are offered as are cabin amenities that make the boat suitable for overnighting and long distance cruising. Unlike many builders, MTI-V took the time to get the bottom design fine tuned for the perfect blend of speed and cruising ability with flawless handling manners. This revolutionary “Slot V” design provides a ride that is far more advanced than other boats. So far that we took the time to Patent the design. The twin keels provide handling manners as if the boat was on rails. There is never any indication of sliding or hooking in a corner.